I know this recipe sounds like a double wammy, but I slimmed it down significantly – swapping out the butter for low-fat margarine and using low-fat potato chips. I love these sweet and salty treats! Preheat over to 300° F. Mix butter and sugar until light and fluffy. 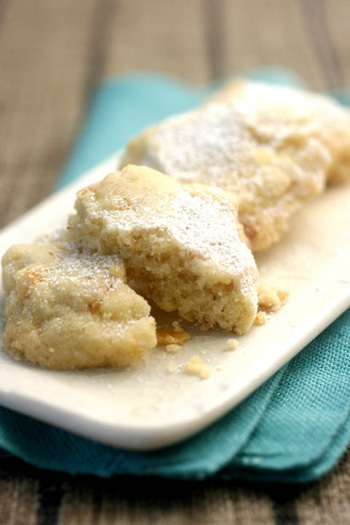 Stir in vanilla and flour until completely incorporated. Fold in potato chips. Drop a teaspoon of the batter onto ungreased cookie sheets. With a fork dipped in flour, flatten the top of each cookie slightly. Bake for 17-18 minutes or until cookies are lightly brown. Allow to cool on a wire rack, then dust with confectioner's sugar. Nutritional Stats Per Serving (1 cookie): 83 calories, 1 g protein, 12 g carbohydrates, 3 g fat (0 g saturated), 0 mg cholesterol, 1 g fiber, 102 mg sodium.